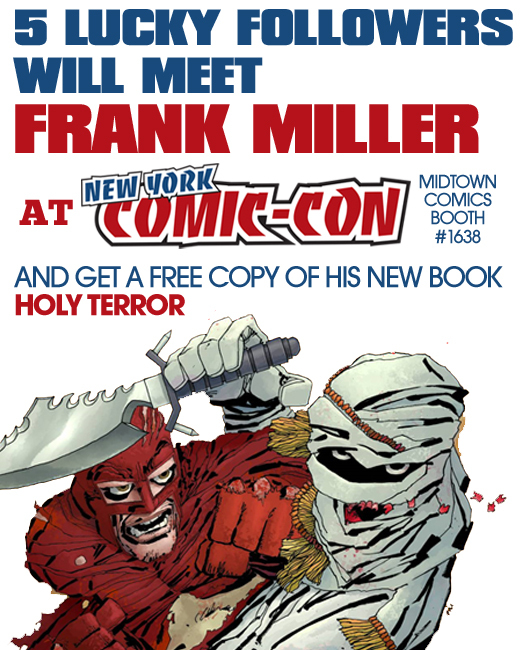 Win a ticket to a VIP Frank Miller signing at Midtown Comics’ New York Comic Con booth! We’re giving our fans and followers a chance to meet Frank Miller at an extremely limited signing appearance at the Midtown Comics booth at New York Comic Con! Enter now! The signing will take place on Saturday October 15th at 5:45 p.m.
Prize is for the Frank Miller signing event ONLY. You must provide your own travel and ticket to the convention. 1) Follow Midtown Comics on Twitter.com, winners must be following Midtown Comics to be eligible. 3) Wait and see who wins! A PURCHASE WILL NOT IMPROVE YOUR CHANCES OF WINNING. The Midtown Comics Twitter Contest (“Sweepstakes”) is by internet entry only. The sponsor of this Sweepstakes is Midtown Comics, 200 West 40th Street, NY, NY 10018 (the “Sponsor”). The Sweepstakes shall be subject to these Official Rules, and by entering, all participants agree to be bound by the terms and conditions herein. ELIGIBILITY: THE MIDTOWN COMICS TWITTER SWEEPSTAKES (“Sweepstakes”) IS OPEN ONLY TO LEGAL RESIDENTS OF THE CONTIGUOUS CONTINENTAL UNITED STATES, EIGHTEEN (18) YEARS OF AGE OR OLDER AS OF ENTRY DATE. Employees and their families of Sponsors, their respective affiliates, subsidiaries, parent companies, agencies and those living in the household of same are not eligible to enter or win. All U.S. Federal, state and local rules and regulations apply. By entering this Sweepstakes, entrants agree to abide by all terms of these Official Rules. HOW TO ENTER ONLINE: You may enter via the Internet by logging onto http://bit.ly/njkuPQ (the “Entry Site”) and following the Sweepstakes entry directions. ALL ONLINE ENTRIES MUST BE RECEIVED BY 5:00:00 pm (EST) on the deadline stated in the posting. The Promotion Parties, prize suppliers, and any and all Internet server(s) and access provider(s), and each of their respective affiliates, subsidiaries, parent corporations, retailers and advertising and promotional agencies, and all of their officers, directors, shareholders, employees and agents (collectively, “Releasees”) are not responsible for: any incorrect or inaccurate entry information; human errors; technical malfunctions; failures, omissions, interruptions, deletions or defects of any telephone network, computer online systems, computer equipment, servers, providers, or software, including without limitation any injury or damage to participant’s or any other person’s computer relating to or resulting from participation in the Sweepstakes; inability to access the Entry Site; theft, tampering, destruction, or unauthorized access to, or alteration of, entries; data that is processed late or incorrectly or is incomplete or lost due to telephone, computer or electronic malfunction or traffic congestion on telephone lines or the Internet or any web site (including the Entry Site) or for any other reason whatsoever; changes in schedule of the Event; typographical, printing or other errors; any deposited or mailed entries which are late, lost, incomplete, misdirected, stolen, mutilated, illegible, or postage due, or any combination thereof. Proof of mailing entry, depositing entry in display at Event or entering information at the Entry Site is not considered proof of delivery or receipt. Illegible, incomplete, and mechanically reproduced entries will be disqualified. All entries become the property of the Sponsors and will not be acknowledged or returned. False, fraudulent or deceptive entries or acts shall render entrants ineligible. By entering the Sweepstakes, entrants affirm that they have read and accepted these Official Rules. The Sweepstakes shall be governed by and construed in accordance with the laws of the United States. By entering the Sweepstakes, entrants hereby submit to the jurisdiction and venue of the federal and state courts of the United States and waive the right to have disputes arising out of the subject matter hereof adjudicated in any other forum. The information obtained via the entry will be used by Sponsors and their affiliates for marketing purposes. Sponsors and their affiliates would like to use this information to contact you either by mail or email with updates about special promotions or offers. WINNER SELECTION: the winner(s) will be determined by random selection conducted by Midtown Comics from among all eligible entries. If a prize notification or prize is returned as undeliverable for any reason, the prize will be awarded to an alternate winner in a subsequent random drawing. Prize is not transferable, assignable, or redeemable for cash. No substitution for the prize by the winner will be allowed. If necessary, due to unavailability of the prize for any reason, a prize of equal or greater value will be awarded at the sole discretion of the Sponsors. The odds of winning the prize are determined by the total number of eligible entries received. All Federal, state and local tax liabilities are the responsibility of the winner. Acceptance of the prize constitutes permission (except where prohibited) for the Sponsors to use the winner’s name, likeness, biography, statements, and any other similar materials for marketing, promotional and publicity purposes without additional compensation or any limitation. LIMITATIONS ON LIABILITY: Releasees shall not be liable to winner or any other person for failure to supply the prize or any part thereof, by reason of any acts of God, any action(s), regulation(s), order(s) or request(s) by any governmental or quasi-governmental entity (whether or not the action(s), regulations(s), order(s) or request(s) prove(s) to be invalid), equipment failure, terrorist acts, earthquake, war, fire, flood, explosion, unusually severe weather, hurricane, embargo, labor dispute or strike (whether legal or illegal), labor or material shortage, transportation interruption of any kind, work slow-down, civil disturbance, insurrection, riot, or any other cause beyond Sponsors’ sole control. If for any reason this Sweepstakes is not capable of running as planned, or if this Sweepstakes or any web site associated therewith (or any portion thereof) becomes corrupted or does not allow the proper playing of the Sweepstakes and processing of entries in accordance with these rules, or if infection by computer virus, bugs, tampering, unauthorized intervention, actions by entrants, fraud, technical failures, or any other causes, in the Sponsors’ sole opinion, corrupts or affects the administration, security, fairness, integrity, or proper conduct of this Sweepstakes, the Sponsors reserve the right, at their sole discretion, to disqualify any individual implicated in such action and/or to cancel, terminate, modify, or suspend this Sweepstakes or any portion thereof. In the event this Sweepstakes is cancelled, the Sponsors will conduct a random drawing to award all prizes from among all eligible, non-suspect entries received prior to the time of the action or event warranting such cancellation. If such cancellation, termination, modification, or suspension occurs, notification will be posted at the Entry Site. ANY ATTEMPT BY AN ENTRANT OR ANY OTHER INDIVIDUAL TO DELIBERATELY DAMAGE (“HACK”) ANY WEB SITE (INCLUDING THE ENTRY SITE) OR UNDERMINE THE LEGITIMATE OPERATION OF THE SWEEPSTAKES IS A VIOLATION OF CRIMINAL AND/OR CIVIL LAWS AND SHOULD SUCH AN ATTEMPT BE MADE, THE SPONSORS RESERVE THE RIGHT TO SEEK DAMAGES AND OTHER REMEDIES FROM ANY SUCH PERSON TO THE FULLEST EXTENT PERMITTED BY LAW. If a dispute arises about who submitted an entry on the Entry Site, the entry will be deemed submitted by the authorized account holder of the e-mail account entered. The authorized account holder is deemed the natural person who is assigned to an e-mail address by an Internet access provider, service provider, or other online organization that is responsible for assigning e-mail addresses for the domain associated with the submitted e-mail address. A potential winner may be requested to provide Sponsors with proof that the potential winner is the authorized account holder of the e-mail address associated with the winning entry and that all eligibility requirements are met. NOTE: Internet entry must be made by the entrant only at the Entry Site. Entries made by any other individual or any entity, and/or originating at any other web site or e-mail address, including, but not limited to, commercial sweepstakes subscription notification and/or entering service sites, will be declared invalid and disqualified for this Sweepstakes. The use of any device to automate the entry process is prohibited.